RSSI or Received Signal Strength Indicator is the name for the signal strength of a wireless network environment. It is not noticeable to a user of a receiving device, however the IEEE 802.11 devices provide their users with signal measurement data, because in fact the signal strength can vary dramatically thus affecting the functionality in wireless networking. RSSI measurements represent the relative quality of a received signal on a device. RSSI indicates the power level being received after any possible loss at the antenna and cable level. The higher the RSSI value, the stronger the signal. When measured in negative numbers, the number that is closer to zero usually means better signal. As an example -50 is a pretty good signal, -75 - is fairly reasonable, and -100 is no signal at all. Even though RSSI and dBm are different units of measurement they both indicate the signal strength. The dBm is a power ratio of the measured power as references to one mW (milliwatt). While dBm is an absolute index, the RSSI is a relative one. For the meaningful good quality signal measurement subtract the noise on the line from signal power. A higher difference of signal to noise means better WiFi signal strength. Even though there is no universal solution, we'll try to break down the approximate interrelation between RSSI and quality percentage. Signal Quality is a value from 0% to 100%. The higher the number the better the link quality. These are theoretical numbers for ideal conditions in regards to local noise. Depending on the system and device you use it can be determined differently and is based on signal strength and SNR margin. Usually the signal is usable if the quality is above the level of 25-30%. Higher SNR margin values mean clearer signals. As an example, using the full 54 Mbps data rate will require at least 25 dB of SNR margin. RSSI can help determine when the level of radio energy in the channel is lower than a certain point so that the network card is clear to send (CTS). At that time the packet of data can be sent. 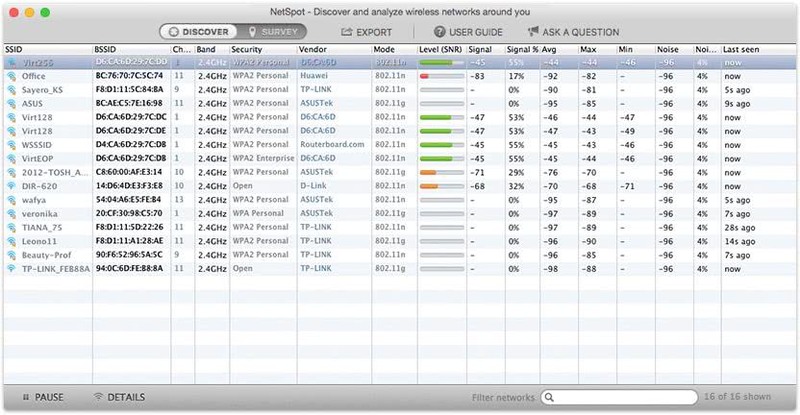 The network monitoring tool like NetSpot allows an end user to observe an RSSI value while measuring the signal strength of a WiFi network. Just for reference, Cisco Systems cards have an RSSI_Max value of 100 and will report back 101 power levels. The 802.11 standard does not give any definition of how RSSI value and power level in mW or dBm relate. Chipset makers and vendors give their own accuracy, granularity, and range for the actual power (mW or dBm). Also the range of RSSI values is individual, ranging from 0 to RSSI_Max. RSSI value is obtained during the preamble stage of getting an 802.11 frame, not from the full frame. To understand and use your signal strength measurements for the most efficient channel planning decisions, NetSpot shows signal strength in two ways. 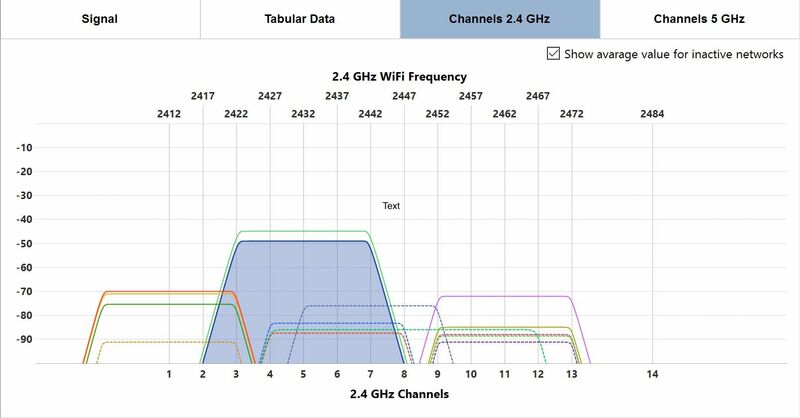 The Networks Chart visualizes the location of selected networks on the 2.4 or 5 GHz bands in relation to other networks, and displays the signal strengths for each of them. The Signal Strength graph visualizes the changes in your network’s signal strengths as you move around the space. Still having issues even though the signal strength is at the acceptable level? If after all measurements and checks done by a WiFi scan app like NetSpot, that showed your signal strength as acceptable, the connection is still not good, then the problem may be caused by interference. Your computer's WiFi adapter and NetSpot app can help you determine the causes of WiFi interference and improve your wifi signal strength.